Discovering that a favourite program won't start is generally enough in itself to spoil your day, but unfortunately the real frustrations begin later, when you try to figure out why. You shouldn't expect the application itself to offer much help. If you see an error message at all it'll generally be overly technical, or impossibly vague ("a module could not be found") - in most cases you'll be left on your own. 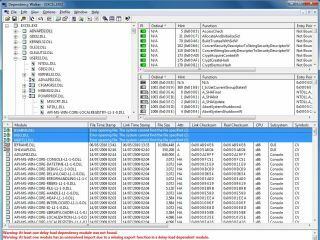 If you're a Windows expert then you could run something like Sysinternals Process Monitor, which will record everything your app is doing and may highlight the problem. But this requires some expertise. It might take a while. And there's a much more straightforward alternative that could point you in the right direction. Just download, unzip and launch the free Microsoft Dependency Walker, then drag and drop an executable file onto it, and the program will immediately list all the DLLs and other supporting files it requires. If any particular files are missing or have other issues then they'll be highlighted at the top of the Module list - and these could be the cause of your problem. We only say "could be the cause" here because diagnosing these errors is an uncertain business. Applications can run normally even when Dependency Walker reports a few apparent issues. But just having a list of suspect files may provide the clues you need, and if you head off to Google and search for each file name in turn (focusing first on any files that aren't a Windows component) then you may find others reporting similar problems. And, with any luck, some answers. You need to be careful about any solutions you might see recommended, though, because some can cause more issues than they solve. Don't start dragging and dropping DLLs around on your own PC, for instance - that can be dangerous. And it's also a bad idea to download a replacement DLL from some random website. Even if it's not infected with malware, there's no guarantee you'll be getting the version you need. A better answer will explain how you can get this DLL (or other file) by installing some component from a trusted source: Microsoft's Visual C++ redistributable files, for instance. If Dependency Walker doesn't provide any useful information from the initial drag and drop, then you could allow it to profile your application. This runs the program and monitors what it's doing more closely, and can provide valuable extra details. These can also be extremely complicated, but if you'd like to give it a try, then drag and drop your program onto Dependency Walker, click Profile > Start Profiling > OK, and check its report for further information on your startup troubles.